Yalta — a resort city in southern Crimea, which until recently was part of Ukraine, now the Crimea is one of the regions of the Russian Federation. 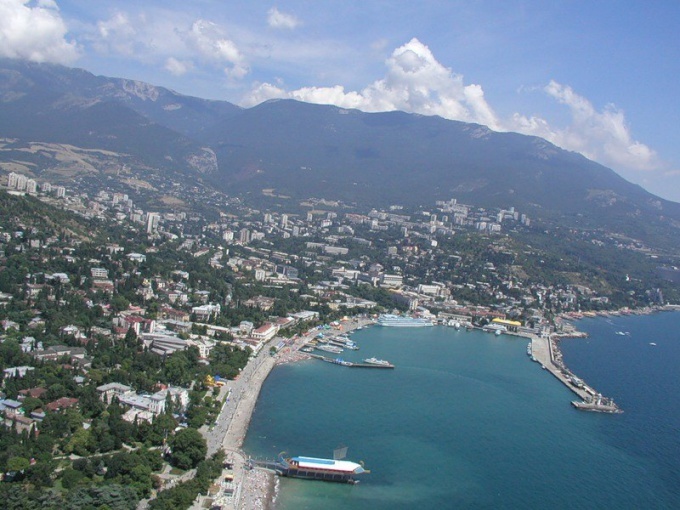 There is actually a city and County town of Yalta (Yalta city Council) — is a coastline more than 70 km. starts Big Yalta from foros in the West and stretches to Krasnokamenka in the East. Unfortunately, a direct rail link to Yalta no, because the city is located far off the coast of the Black sea. But, the train ride to the nearest station on the railroad is the Simferopol or Sevastopol. Tickets must be purchased in advance, start selling tickets 45 days before the departure date, the tickets need to take one of these stations. By train from Moscow to go in about 22-24 hours. From Kursky railway station of Moscow departs daily from two to three trains a day. The cost of second-class places — from 2 800 to 3 300 rubles, coupe — from 4 900 to 5 800, Suite — from 10 500 to 12 000 rubles. From Moscow go to the following trains: Moscow - Sevastopol, Moscow - Simferopol. In addition, you can drive from Moscow to Krasnodar, from there, approximately every 2 hours, trains to Simferopol. Currently (2014) the trains to the Crimea go two ways: through Ukraine and via ferry in the Kerch Strait. Four passenger trains run from Moscow to Simferopol, Sevastopol and Kerch through the territory of Ukraine. These compounds formed the Crimean railway, which is not structurally part of the company Russian Railways. It trains N17/18 Sevastopol-Moscow-Sevastopol, N68/67 N40/39 Simferopol-Moscow-Simferopol and the train N98/97 Kerch-Moscow-Kerch. They will proceed to the Peninsula transit. In addition, between the Crimea and several Russian cities will be served by trains formed by Ukrzaliznytsia. But the trains of the Federal passenger company (a subsidiary of RZD) on the Peninsula regularly do not go. Through the steam trains, which are formed in Russia. They go through Krasnodar, then to the Kerch Strait, where the cars are sealed, loaded onto the ferry, and passengers are close by. Then in Kerch train continues its journey on the rails. There is an interesting option as you can get to Yalta is a single ticket in the Crimea. By train you go to stations of Anapa or Krasnodar. Further organized communication between stations of Anapa, Krasnodar and settlements of the Crimea by road and sea transport. For travel to the Crimea at the box office, passengers are issued a ticket for transportation by rail, Boarding pass and Coupon to receive services for travel by sea and road transport (ferry and bus). The design of the stamps is only possible with the simultaneous travel document on long-distance trains and ends 24 hours before train departure. All flights (train-bus-ferry-bus) can interface at the time of departure. Buses at the place and time of departure of flights, ferries and trains. Boarding pass to Simferopol or Yalta costs 750 rubles. This cost is added to the train ticket at the time of his purchase at the checkout. The road to the ferry from Krasnodar is 2.5 hours. If you drive from Anapa to three times less. The first option - on the bus. This trip will cost very cheap. Trolley buses run on schedule every 15-20 minutes. During the trip, which is like a separate tourist route, you can see how slowly changing the landscape, mountains, sea. Trolleybus stop is near the train station, buy the ticket and wait 5-10 minutes before the next trolley. The following is the optimal alternative - bus. The cost of travel to Yalta is more expensive in 2 times, but the speed is exactly as much faster. These taxis are all of foreign manufacture, very comfortable and spacious. Boarding the bus is carried out immediately at the station. The last option, of course, taxis. It is comfortable, is very expensive, and you will arrive just 10-15 minutes before the bus. The annexation of Crimeaand Russia was a significant event for many. The Crimean Peninsula is a great place for a summer vacation. However, not all tourists have the idea of how to get to the Crimea with minimal cost. In the spring of 2014 from Sheremetyevo international airport began to operate the aircraft in the direction of "Moscow-Simferopol". The cost of tickets varies from 3 to 4.5 thousand rubles. The price depends on the airline and class of places. In addition to the Russian capital in Simferopol can be reached from Krasnodar, Orenburg, Rostov-on-don, St. Petersburg. It should be noted that it is better to buy tickets in advance as demand for this area is quite large. Passengers using the so-called single ticket that provides the opportunity to travel by any mode of transport (rail, sea and air) have a great chance to choose the most comfortable way to travel. To buy this ticket at any railway ticket office in the city. It should be clarified that the day before the departure date the sale ends. This is because the operator needs to have all the information on the number of passengers. At the box office potential passengers in addition to the train ticket, issue boarding pass, combined bus-ferry-bus. That is, the tourist arrives to Krasnodar or Anapa, and then transplanted the bus reaches the port of "Caucasus". Next, the ferry will deliver passengers to Kerch, and from there by bus you can travel directly to any city of the Crimea. According to estimates of the Ministry of transport of the Russian Federation, this route is the best option. By the way, such transportation is called intermodal. A great option is the route "Moscow-Crimea". In this case, the tourist must link to Krasnodar train and then purchase a bus ticket to the Crimea. The bus station of the city of Krasnodar is located near the train station. It should be noted that the bus service between the southern cities of Russia and settlements of the Peninsula is functioning perfectly. All passenger transport almost immediately drives onto the ferry without waiting in line and adhere to the schedule. Or drive to Anapa, and then on a fast catamaran by sea 2 hours to reach the port "Caucasus". After you should take the ferry to the Crimea. 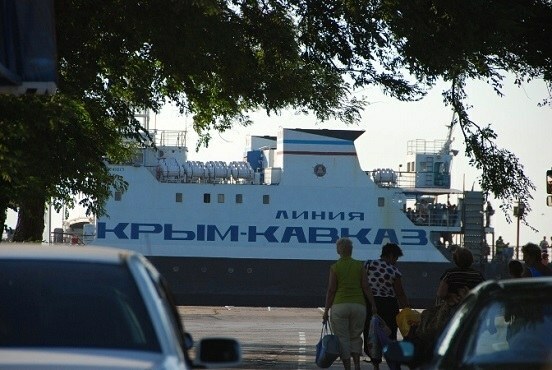 In 2014, the trigger was a train "Moscow-Simferopol", but to remove load on steam and reduce the queue of cars with tourists, it was decided the cars across the Strait to transport. Passengers on the other side of the Crimean waiting for the train, after which they continue the path. When they reached the Western tip of the Taman Peninsula, the question of the crossing through the Kerch Strait. For the convenience of motorists on the water ferry because the bridge is only possible by 2018. In the summer you can cross that river every 2 hours. Pre-register, which ends 35 minutes before departure. The ferry takes the car to the other side in 20 minutes. In addition, all travelers who prefer to travel by car, you should have patience, because wanting to get to the Peninsula quite a lot. Sometimes the waiting time can be 2 hours or more.